It’s the end of the month, so time to check in on the popularity of the leading Hugo and Nebula contenders! To do this, I use Goodreads numbers. We don’t have a lot of reliable ways to measure sales in the SFF field. Publishers tend to keep their numbers secret, so we’re left having to estimate via the number of Goodreads or Amazon ratings. Since Amazon bought Goodreads in 2013, the Amazon and Goodreads dating has been converging. I prefer Goodreads because it has a larger sample size. Goodreads is not even close to 100% accurate. My current guess is that it samples 5%-20% of the American readership, and that this varies substantially from author to author. So one author might be sampled at a 20% rate, but another at only 5%. Since Goodreads is now integrated with Amazon kindle, it very much favors books that sell large numbers through Amazon. Authors that sell large numbers of copies through physical outlets, such as Stephen King, do much worse in these numbers. Goodreads also slants decidedly young in its demographic, with all the various statistical issues that brings. So take these with a grain of salt, and they’re better for comparison purposes than for absolutes. Look for differences in order of magnitude, not fine-grain differences such as whether one book has 500 more readers than another. What I’m looking for is a general since of which novels are “hot” and which are selling more slowly. Since this is the first year of Chaos Horizon, we don’t know how predictive sales are for the awards; I don’t think there’s a simple correlation like “more sales = greater chances of winning.” However, there is probably some sort of “sales floor” we can discover. Without moving some copies, you’re not popular enough to get nominated or win. I also think picking up lots of readers in January has got to help your Hugo/Nebula chances; the fresher a book is in the mind, the better chance of voting for it. Here’s the full Excel data; it’s getting too bulky to present here on WordPress: Hugo Metrics. I’ve got data going back to October. Methodology: I record the # of Goodreads rating on the last day of the month. I’m still blown away by how well The Martian is doing. According to Goodreads, more people read The Martian last month than the bottom 15 books on my list combined. That’s sales power! If The Martian proves to be eligible for the 2015 Hugo, it’ll be a formidable competitor. It would be very interesting to see how such a “mainstream” SF hit does against a more literary SFF novel like Annihilation. Mandel’s Station Eleven is also on fire, putting up a huge 10,000 reader month. I think that number solidifies Mandel’s Nebula chances, and if she grabs a Nebula nomination, she could make a run at a Hugo nomination. I added Skin Game to the list for this month, to get a look at how a popular mainstream urban fantasy novel does against it’s science fiction and fantasy brethren. Very well, it turns out. I’m surprised that January did better than December. People must have been too busy with Christmas too read! It’s interesting to see something like The Martian build momentum over the last 3 months; word of mouth really is paying off for a book like that. In contrast, something like Ancillary Sword is basically flat over those same three months. I’m interested to see if such momentum is predictive or not. Check out previous posts in this series to see the evolution of this data: December, November, October. Jeff VanderMeer has a huge feature up on The Atlantic website about Annihilation, Acceptance, and Authority: From Annihilation to Acceptance: A Writer’s Surreal Journey. Written by VanderMeer himself, it’s a fascinating piece on the writing and publishing of Southern Reach and the various artistic and business decisions went into VanderMeer’s trilogy. Afterwards, writing Annihilation was a simple process: I’d get up and write for three hours, fall asleep, maybe edit a bit in the evenings, and repeat the process. In five weeks, I had a finished novel. I couldn’t concentrate on anything else, in part because I was driven to write, but also because I felt so sick I was either writing or sleeping, with no energy for anything else. Chaos Horizon is a Hugo and Nebula analytics site, and I currently have Annihilation in the #1 slot for both my 2015 Nebula and Hugo predictions. Part of the reason is that you just can’t buy mainstream coverage like this; SFF fans are just as influenced by the mainstream as everyone else (that’s why it’s the mainstream). I’m very interested to see how Annihilation does in this year’s awards. Given that VanderMeer is probably more SFF-adjacent as a weird fiction writer, it would be something of a genre expansion to see the Nebula go to Annihilation. VanderMeer had a previous Nebula nomination for Finch, and Annihilation has been an order of magnitude more popular. The Hugo has been following the Nebula in recent years, so Nebula success can easily lead to Hugo success. We’ll have to wait and see; Nebula nominations should be out within the month. Also check out VanderMeer’s very interesting Atlantic essay on weird fiction: The Uncanny Power of Weird Fiction. Publisher’s Weekly has provided their annual breakdown of print Book Sales by category for 2014. While they use BookScan numbers, which aren’t perfect, this is probably the best “state of the market” data we get. They also exclude e-books, which clearly accounts for a good chunk of the SFF market. Still, this is what we’ve got, and the ratios between SF and Fantasy probably extend into the e-book world. For 2014 Adult Science Fiction, PW reported 4,142,000 sales, which is down 7% from the 2013 number. 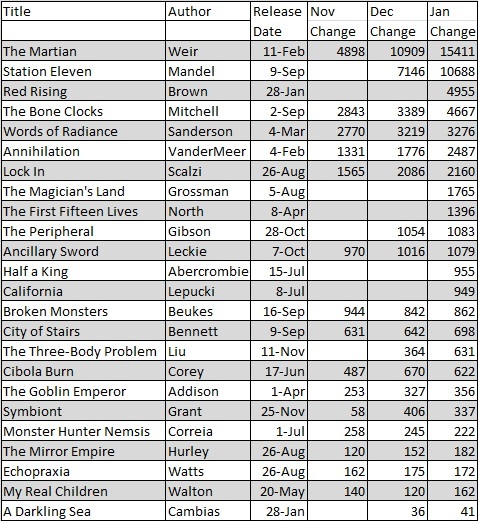 For 2014 Adult Fantasy, PW reported 7,526,000 sales, which is down 13% from the 2013 number. For 2014 Juvenile Science Fiction/Fantasy/Magic, PW reported 45,511,000 sales, a 38% increase from last year. That number boggles the mind. The adult SFF market is 11.7 million sales; the Juvenile market is 45.5 million. Are readers moving from Adult SFF to Juvenile, or is something else happening? When someone reads The Maze Runner or Divergent, does this mean they skipped reading an adult SF novel? Or should this be understood as an expansion of the marketplace? Do readers of Juvenile SFF novels ever translate to readers of adult SFF novels? The segment, which was the largest juvenile genre segment last year, is home to such 2014 blockbusters as the Divergent trilogy, the Frozen franchise, and the novels of James Dashner and Rick Riordan. Are Frozen tie in novels for children really in the same market space as YA dystopias? It would be nice if PW broke these categories up, but we’re lucky to have any sort of numbers. Back to the Adult numbers: SF made up 35% of the speculative market, and Fantasy 65% of that market. Should that ratio be reflected in the number of Hugo and Nebula nominations? It’s also a little frightening to think of how small that 11.7 million number truly is. The 2014 finale of The Walking Dead grabbed 14.8 million viewers in a single night. A year’s worth of SFF fans only bought 11.7 million print novels. How Many Nominating Ballots for the 2015 Hugo? 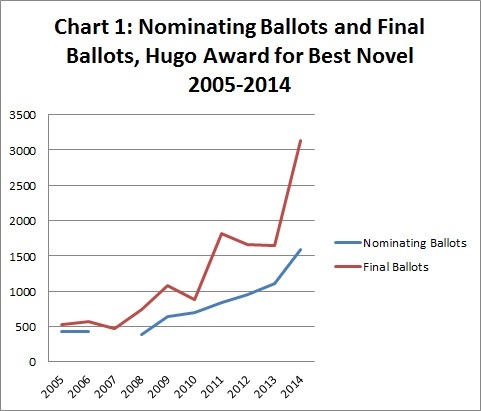 The turnout for the 2014 Hugo Award was unprecedented, with a huge jump in both nominating and final ballots. There are several reasons for that jump: London was a bigger than normal WorldCon city, and that certainly brought in more fans. Spokane in 2015 isn’t going to come close. The 2014 Hugo debate was also unusually vehement, with Larry Correia’s Sad Puppy campaign and the Wheel of Time‘s “whole series deserves a nomination” campaign drawing in an unusual number of supporters and protesters. All of that led to a near-doubling of the final Hugo Best Novel vote, from 1649 final Best Novel ballots in 2013 to 3137 Best Novel ballots in 2014. 3.7.1: The Worldcon Committee shall conduct a poll to select the nominees for the final Award voting. Each member of the administering Worldcon, the immediately preceding Worldcon, or the immediately following Worldcon as of January 31 of the current calendar year shall be allowed to make up to five (5) equally weighted nominations in every category. Frustratingly, I couldn’t find any data for the number of nominating ballots in 2007. The .pdf of that info only gives the number of nomination per book, not the total number of Best Novel ballots. If anyone has that data point, I’d love to patch up the chart. Carryover is my awkward term for the ratio between Next Year’s Nominating Ballots divided by Previous Year’s Final Ballots. Since the last year’s Final Balloteers can vote in the next award, this ratio is what we need to predict the number of voters for 2015. Of course, not every voter from the past year will vote, and you can see a definite perturbation in the line based on location as well. Nonetheless, if we average those out, we can see that the number of nominees works out to be around 78% of the previous year’s final vote. Let’s just call it 75% for a ballpark. Imprecise, I know, but this will give us a start. That chart really shows how unusual 2014 was, but the general trend has definitely been towards more Hugo voters and more Hugo nominators. 1. If we accept that 75% number, that would mean roughly 2350 nominating ballots for 2015. That seems huge, but even if you went with only 50% carryover, we’d have 1580, which is almost the biggest ever. If we land on a middle-ground number like 2000, that’s means each novel will need around 200 votes (10%) to make it into the final Hugo slate. 2. Each of the 2014 Hugo nominees (Leckie, Correia, Stross, Grant, Sanderson) has a sizeable built-in Hugo advantage for 2015. Let’s zoom in on Correia as an example: last year, 332 people voted Warbound as the Best Novel of 2014. If 75% of those nominate Correia again—as they’re fully eligible to do—that would likely get him into this year’s field. 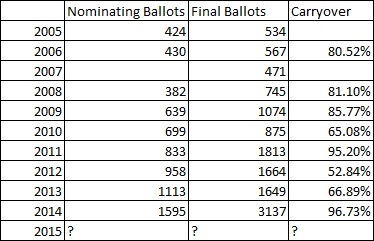 Sanderson’s case is even more interesting: 658 voters placed Wheel of Time in the #1 spot on their final 2014 ballots. Now, Sanderson isn’t Robert Jordan, but what percentage of those are going to support Words of Raidance? If we use that 200 bar I estimated above, that means Sanderson needs to keep only 30% of the WOT vote to make the slate. Doable? I don’t know. 3. A bigger pool of nominators might make it harder for lesser known authors to get into the 2015 field. In 2013, it only took Saladin Ahmed 118 votes to sneak into the final slate. In 2014, it took Mira Grant 98. That number could double for 2015. You’ll need either broad or passionate support to make the 2015 slate, something more niche novels might not be able to muster. It’s easy to imagine a 2015 scenario where Leckie keeps her vote, Correia keeps his vote, and Sanderson grabs a sizeable percentage of The Wheel of Time vote. That’s 3 spots already. Stross could keep his vote, or it could slide over to Scalzi (all S authors are interchangeable, right?). Grant is the borderline case. She was the lowest nominator and final ballot recipient of the bunch last year, and thus the most likely to drop off. In that scenario, the entire rest of the SFF world is fighting for one open Hugo spot. One thing that makes the Hugo unusual—and interesting—are some of the oddities of its nominating and balloting practices. How is 2015 going to play out? Are we looking at a record turnout? And does a record turnout mean record repetition? Stay tuned . . . for more Chaos! (Insert laughter and more terrible jokes). This list is by no means final: new books will be announced through throughout the year, and it’s next to impossible to know what books by new/unknown authors will be important 12 months from now. This is an initial direction, no more. Despair if you must! Here’s what I’ve got so far. All publication dates are from Amazon. As always, let me throw out my disclaimer: here at Chaos Horizon, I try to predict what will happen, not what should happen. Don’t take my list as an endorsement (or condemnation!) of any particular book. A busy year, with plenty of books by well-known authors. Stephenson returns with another awkwardly titled epic; Bacigalupi delivers his first adult SF novel since his 2010 Hugo and Nebula wins; and Leckie wraps up her Ancillary trilogy. On the fantasy front, Liu is delivering his debut novel, the first part of an ambitious trilogy. Okorafor’s book is a prequel to her well-liked Who Fears Death, which scored a Nebula nom and a World Fantasy win back in 2011. The Fifth Season seems to move Jemisin into post-apocalyptic SF, and she had Nebula noms in 2011, 2012, and 2013, as well as a Hugo nomination from 2011. Both the Nebula and Hugo are very repetitive, as we learned from my Repeat Study—but they aren’t this repetitive. It’ll be about 65% repeaters for the Hugo, 50% for the Nebula (if past patterns hold true), so not each of these 6 books is going to make the final slate. Still, they’re a strong place to start. Of course, we don’t know if each of these books will live up to expectations, but that’s what the next year is for. These books are all viable candidates based on past award history or early buzz. I won’t go through them one by one, but this at least gives me a chance to begin organizing my reading. Each of these potential nominees will need to be well-received when the book actually comes out. No one has read most of these books yet, so we don’t know if they’re good, great, or just average. I’m sure I missed as many books as I’ve included. What else is coming out in 2015 that has a shot at either a Hugo or Nebula in 2016? Good grief, 2016 sounds like the far future, doesn’t it? And don’t worry—I’ll try not to mention the 2016 awards again until after the 2015 Hugo and Nebula are awarded. The Lee is a post-collapse novel set in a United States struggling to maintain some semblance of civilization and order, and traces a character leaving her commune and exploring a dystopic landscape. It’s interesting to see Lee grab a nomination instead of the literary darling Station Eleven, but Lee does have the more established reputation. Speculative books have done very well in the past 18 months on the literary awards circuit: a 2014 win in the PEN/Faulkner for Karen Joy Fowler’s We Are All Completely Beside Ourselves, a 2014 nomination for the National Book Award for Emily St. John Mandel’s Station Eleven, and 2014 Booker nominations for Karen Joy Fowler and Howard Jacobson’s J.
That’s a much friendlier stance towards genre fiction than in previous years, although all of these are certainly very “literary.” Trend or exception? If literary SFF starts sneaking into the major literary awards, will it continue to have a place in the Nebula? 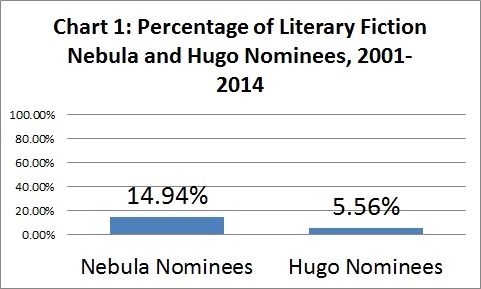 A sub-category of my broader genre study, this post addresses the increasing influence of “literary fiction” on the contemporary Hugo and Nebula Awards for Best Novel, 2001-2014. I think the general perception is that the awards, particularly the Nebula, have begun nominating novels that include minimal speculative elements. Rather than simply trust the general perception, let’s look to see if this assumption lines up with the data. Methodology: I looked at the Hugo and Nebula nominees from 2001-2014 and ranked the books as either primarily “speculative” or “literary.” Simple enough, right? Unless otherwise specified, Hugo Awards are given for work in the field of science fiction or fantasy appearing for the first time during the previous calendar year. Without a clear definition of “science fiction or fantasy,” it’s left up to WorldCon or SFWA voters to set genre parameters, and they are free to do so in any way they wish. 1. Books by literary fiction authors (defined as having achieved fame before their Hugo/Nebula nominated book in the literary fiction space) that use speculative elements. Examples: Cloud Atlas, The Yiddish Policeman’s Union. 2. Books by authors in SFF-adjacent fields (primarily horror and weird fiction) that have moved into the Hugo/Nebulas. These books often allow readers to see the “horror” elements as either being real or imagined. Examples: The Drowning Girl, Perfect Circle, The Girl in the Glass. 3. Books by already well-known SFF authors who are utilizing the techniques/styles more commonplace to literary fiction. Examples: We Are All Completely Besides Ourselves, Among Others. I will classify a book as “literary” if a reader could pick the book up, read a random 50 page section, and not notice any clear “speculative” (i.e. non-realistic) elements. Try applying this to Cloud Atlas. Mitchell’s novel consists of a series of entirely realistic novellas set throughout various ages of history and one speculative novella set in the future. If you just picked the book up and started reading, chances are you’d land in one of the realistic sections, and you wouldn’t know it could be considered a SFF book. Consider We Are All Completely Beside Ourselves, Karen Joy Fowler’s reach meditation on science, childhood, and memory. Told in realistic fashion, it follows the story of a young woman whose parents raised a chimpanzee alongside her, and how this early childhood relationship shapes her college years. While this isn’t the place to decide if Fowler deserved a Nebula nomination—she won the National Book Award and was nominated for the Booker for this same book, so quality isn’t much of a question—the styles, techniques, and focus of Fowler’s book are intensely realistic. Unless you’re told it could be considered a SF novel, you’d likely consider it plain old realistic fiction. With this admittedly imperfect definition in place, I went through the nominees. For the Nebula, I counted 13 out of 87 nominees (15%) that met my definition of “literary.” While a different statistician would classify books differently, I imagine most of us would be in the same ball park. I struggled with The City & The City, which takes place in a fictional dual-city and that utilizes a noir plot; I eventually saw it as being more Pychonesque than speculative, so I counted it as “literary.” I placed The Yiddish Policeman’s Union as literary fiction because of Chabon’s earlier fame as a literary author. After he establishes the “Jews in Alaska” premise, large portions of the book are straightly realistic. Other books could be read either as speculative or not, such as The Drowning Girl. Borderline cases all went into the “literary” category for this study. Given that I like the Chabon and Mieville novels a great deal, I’ll emphasize I don’t think being “literary” is a problem. Since these kinds of books are not forbidden by the Hugo/Nebula by-laws, they are fair game to nominate. These books certainly change the nature of the award, and there are real inconsistencies—no Haruki Murakami nominations, no The Road nomination—in which literary SFF books get nominated. As for the Hugos, only 4 out of 72 nominees met my “literary” definition. Since the list is small, let me name them here: The Years of Rice and Salt (Robinson’s realistically told alternative history), The Yiddish Policeman’s Union, The City & The City, and Among Others. Each of those pushes the genre definitions of speculative fiction. Two are flat out alternative histories, which has traditionally been considered a SFF category, although I think the techniques used by Robinson and Chabon are very reminiscent of literary fiction. Mieville is an experimental book, and the Walton is a book as much “about SFF” as SFF. I’d note that 3 of those 4 (all but the Robinson) received Nebula nominations first, and that Nebula noms have a huge influence on the Hugo noms. Even with my relatively generous definition of “literary,” that’s not a huge encroachment. Roughly 1 in 6 of the Nebula noms have been from the literary borderlands, which is lower than what I’d expected. While 2014 had 3 such novels (the Folwer, Hild, and The Golem and the Jinni), the rest of the 2010s had about 1 borderline novel a year. The Hugos have been much less receptive to these borderline texts, usually only nominating once the Nebula awards have done. We should note that both Chabon and Walton won, once again reflecting the results of the Nebula. So what can we make of this? The Nebula nominates “literary” books about 1/6 times, or once per year. The Hugo does this much more infrequently, and usually when a book catches fire in the Nebula process. While this represent a change in the awards, particularly the Nebula, this is nowhere as rapid or significant as the changes regarding fantasy (which are around 50% Nebula and 30% Hugo). I know some readers think “literary” stories are creeping into the short story categories; I’m not an expert on those categories, so I can’t meaningfully comment. I’m going to use the 15% Nebula and 5% Hugo “literary” number to help shape my predictions. I may have been overestimating the receptiveness of the Nebula to literary fiction; this study suggests we’d see either Mitchell or Mandel in 2015, not both. Here’s the full list of categorizations. I placed a 1 by a text if it met the “literary” definition: Lit Fic Study. Hot off the presses is my newly collated SFF Critics Meta-List! This list includes 8 different “Best of 2014” lists, all by outlets that have a reasonable chance of either reflecting or influencing the Hugo/Nebula awards. Currently included: Coode Street Podcast, io9, SF Signal, Strange Horizons, Jeff VanderMeer writing for Electric Literature, Adam Roberts writing for The Guardian, Tor.com, and a A Dribble of Ink. The lists were chosen because of their reach and previous reliability in predicting the Hugos/Nebulas (Tor, io9); the fame of the authors (VanderMeer, Roberts); or because the website/fancast has been recently nominated for a Hugo (Dribble, Strange Horizons, SF Signal, Coode Street). Any comments/questions about methodology are welcome. Points: 1 point per list, unless the list is a collation of more than 3 critics (SF Signal, Strange Horizons, Tor.com). In that case, books can grab a maximum of 2 points, pro-rated for # of mentions on the list. See here for an explanation of this methodology. Pretty much what I expected. 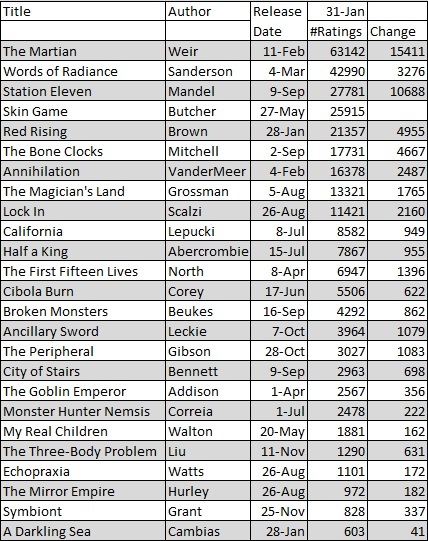 The SFF world is often very repetitive (nominating the same authors over and over again), so Leckie makes sense at #1. She was so talked about for last year’s award she’s a natural for this year, even if people are less excited about Ancillary Sword. VanderMeer, Mitchell, and Bennett are no surprise near the top. Addison’s The Goblin Emperor is doing well, particularly when the lists are a little more fan oriented. She does represent a methodological problem: she has 2 points from SF Signal and 2 points from Tor.com, as well as 1 point from Dribble of Ink. That’s concentrated, not broad support. In contrast, Leckie’s 6.5 points are spread out across 6 venues. If I gave 1 point max per venue, Addison would be knocked down to only 3 points. I’ll keep my eye on the math of this, and make adjustments to my counting as necessary. Remember, the goal is to be predictive, not perfect. We can just wait until the Nebula noms come out, and then reassess at that point. In terms of Addison’s chances: secondary world fantasy is not an easy sell to the Nebula voters. I wouldn’t be shocked to see her on the slate, but I also wouldn’t be surprised if she missed. Given the way that the Nebula slate shapes the Hugo slate, her Hugo chances are closely tied to whether or not she grabs a Nebula nom. Lev Grossman poses something of a problem. The Magicians trilogy is very well regarded, and books like this (fantasy that crosses over into the real world) have done well in the Nebulas as of late. Still, the last books of trilogies have usually NOT been part of the Hugo/Nebula process; it’ll be interesting to see if that bias continues. Beukes is something of a surprise with Broken Monsters. A serial-killer novel that crosses over into a supernatural text in it’s last 50 pages, I’m not sure it’s speculative enough to grab an award nomination. Beukes almost made the Hugo slate last year, so don’t count this one out. Some lesser known works, at least to Americans: Lagoon (no U.S. release, so Nebula eligibility is unlikely), All Those Vanished Engines by Paul Park (not very hyped in the U.S.), The Race by Nina Allan (released in the U.S., but not widely known over here). It’ll be interesting to see if these works continue to be part of the conversation. The snubs: Station Eleven isn’t taking this list by storm. That might reflect a simple timeline problem: the Mandel came out late in the year, so people might only be getting to read it now. The Martian is also way down, but is that because it wasn’t a 2014 book? I’d still like to add several more lists to this collation to see if we get a better convergence. Locus Magazine will have their “Best of 2014,” and I’m waiting for several Hugo nominated blogs to get their lists out (Book Smugglers, Elitist). Anyone else you would suggest for this collation? Here’s the data: Best of 2014. This list is on the second tab. As I’m putting together my “SFF Critics Best of 2014 Meta-List,” I’ve been trying to find lists that are likely to be reflective of the Hugo/Nebula voters. I don’t want to be mired in “old-media,” so I thought I better some “Best of 2014” podcasts to include. The Coode Street Podcast, by Gary K. Wolfe and Jonathan Strahan, has twice been nominated for the “Best Fancast” Hugo Award. Wolfe is a prominent reviewer for Locus Magazine, and Strahan a frequent editor, including for the Best Science Fiction and Fantasy of the Year series. Probably good voices to listen to. More international than most lists, and this bring up an interesting point: major SF novels are getting published in England that aren’t getting published in the US. Lagoon, for instance, would be in the award mix if it had received as US publication. Without that, though, you’re cutting off too much of your potential audience (and probably aren’t even eligible for the Nebula). Books like Wolves or even Europe in Autumn (which was published here but not really marketed) might be worthy of award consideration, but losing over half their potential audience is going to make a Hugo or Nebula nomination next to impossible. Coode street touches on many of the major candidates, and I found their framing of the year in SF quite useful. Coode Street is more interested in SF than in Fantasy, and they don’t discuss some of the fantasy candidates (such as City of Stairs or Goblin Emperor). By having a large number of lists, these genre imbalances should work themselves out. I’ll update and post the Meta-List later today. 1. “Best of Lists” by the mainstream SFF websites: LocusMagazine, Tor.com, io9, basically anything that a ton of possible SFWA or WorldCon voters will see. 2. “Best of Lists” by well-known SFF authors, such as Adam Roberts’ list for The Guardian. 3. “Best of Lists” published by Hugo nominated blogs, fansites, and semiprozines. Given that the Hugo voting audience probably knows these outlets, it makes a certain amount of sense they’d look in that direction. There’s a definite feedback loop in the Hugos, as seen by the sheer number of Repeat nominees. The collating methodology is a little complicated, since a number of these lists (including today’s SF Signal list) are made up of multiple critics. See my Strange Horizons posts for details on how I’m handling points. All these various lists will be collated, and we’ll see where we get. Since these’ll be in an Excel file, we can sort them and see which ones actually correlate to the Hugos/Nebulas when the time comes. Today, I’ll be looking at SF Signal’s “MINDMELD: Best Genre Works of 2014.” SF Signal won the Hugo for Best Fanzine in 2012 and 2013. For their “Best of 2014” post, they invited 14 bloggers, authors, and critics to cover their favorite novels, stories, movies, anime, comics, etc. This kind of broad meta-post gives some great insight into what SFF enthusiasts are thinking about the year in review. The more fan-oriented these lists have been, the better The Goblin Emperor has done. When they’re more professional critic oriented, Annihilation shines. Does that mean a Nebula for VanderMeer and a Hugo nomination for Addison? It’s interesting who doesn’t make the list: VanderMeer, Robert Jackson Bennett, David Mitchell. You figure 1 out of 14 critics would have praised those books, given how widely read they were this year. This might indicate that said books are not reaching every part of SFF fandom. However, you can’t overvalue one last, even if it does include 14 different critics.